The world’s largest managed pollination event is beginning. Demand for bees to pollinate California’s almond orchards is high and shows no signs of lessening. 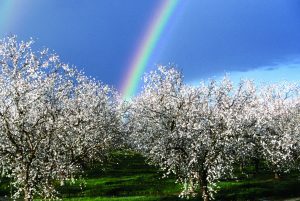 The area of almond orchards is growing but the availability of bees is declining because of bee disease. Almonds are big business and the statistics are impressive. California produces about 80% of the world’s commercial almond crop. The 2018 harvest was forecast to be 2.3 billion pounds (more than 1 billion kgs) in weight and it grows year on year. Pollination costs are $400 per acre ($162 per hectare), although the beekeeper is likely to receive up to $200 per colony. Bees are trucked in from many states to start their annual pollination tour of the country and the economic incentive to have bees ready for this early spring pollination is very high. A curious way of overwintering bees is developing in California taking ideas from Idaho where bees have been stored over winter in cool, but not freezing, potato sheds. In Bakersfield, California, near the almond orchards, they are learning from Idaho with new-style potato-shed overwintering, but beekeepers there are trying to cope with quite a different climate. Central Valley winter temperatures can fluctuate considerably (but mostly above freezing), so potato-shed style overwintering can lessen unproductive activity in winter warmth and help prepare the bees for the almond orchard pollination in February. There can be as many as 40,000 colonies stored in a temperature-controlled shed. Rental is about $20 per colony. One bee farmer is renting out 15,000 colonies this year. It’s big business and healthy bees are key.